Reading is vital to a child's ability to learn and be successful in school. But a child's ability to read does not happen automatically. Children develop important language skills from birth -- and early language abilities are directly related to later reading abilities. The Copper Queen Library is dedicated to connecting parents and caregivers, families, child-care professionals and educators to help children grow and learn. Southwest Human Development strengthens the foundation Arizona’s children need for a great start in life. Our Vision: A positive future for every child. Our Values: Our core values embody Southwest Human Development’s commitment to services that uplift the lives of children, families and other care providers, and the communities in which they live. These values are intended to guide the professional development, ethical conduct and skilled practice of all of our staff, whatever their specific role within the agency. All staff are valued as making essential contributions to strengthening the foundation that Arizona’s children need for a great start in life. Our Work: The first five years of life are the most critical in a child’s development. At Southwest Human Development, our services improve lives and help families by supporting young children and their caregivers during this important time. In partnership with families, we provide children with the care, attention and support needed to set them on a path to success in school and life, and help them reach their fullest capabilities. We bring the best research-based strategies to teachers, parents, administrators, librarians, childcare providers, and anyone else involved in helping a young child become a strong, confident reader. Our goal is to bring the reading research to life — to spread the word about reading instruction and to present "what works" in a way that parents and educators can understand and use. In 2016, the Reading Rockets project received the David M. Rubenstein Prize, the top honor in the Library of Congress Literacy Awards program. The Library of Congress Literacy Awards honor organizations working to promote literacy and reading in the United States and worldwide. The awards recognize groups doing exemplary, innovative and replicable work, and they spotlight the need for the global community to unite in striving for universal literacy. Read the press release here. The Reading Rockets project includes PBS television programs (also available online and on DVD); online services through the websites ReadingRockets.org and ColorinColorado.org; professional development opportunities; and a robust social community on Twitter, Facebook, Pinterest, and YouTube The project is guided by an advisory panel made up of leading researchers and experts in the field of reading. In 2011–2012, we celebrated our 10th anniversary! Teaching reading is a complicated task…so much so, that reading expert Louisa Moats titled her influential article about the skills and knowledge educators need to teach reading well "Teaching Reading IS Rocket Science." That's how Reading Rockets got its name! Read On Arizona is a statewide, public/private partnership of agencies, philanthropic organizations, and community stakeholders committed to creating an effective continuum of services to improve language and literacy outcomes for Arizona’s children from birth through age eight over the next ten years. Read On Arizona is committed to helping create an early literacy system that delivers the right program at the right time for every child. Success in addressing this crisis will require ensuring that young children in Arizona have strong learning experiences from birth through grade three, rich in literacy and language acquisition at school, at home, and in the community. The key to Arizona’s future is a statewide, community-based literacy project. Educators, families, businesses, public agencies, philanthropy and communities all have a role to play. Only when early literacy becomes everyone’s responsibility will we have the kind of impact and change we need to see Arizona thrive. RIF believes every child deserves an opportunity to own books, learn how to read, and obtain the fundamental building blocks to achieve their highest potential. Literacy opens doors and enables every child the chance to live their own journey. Serving as the leader in generating awareness and a sense of urgency for the issue of children’s literacy. Supporting the implementation of these programs in sites across our country in partnership with leading community organizations. Creating high-quality content and programs that address key literacy issues. Engaging with individual volunteers, sites, community groups, and organizations that share our passion to ensure that impact is felt at the local level. The best opportunity to influence a child's future is in the first five years, a critical window of rapid brain development that does not occur at any other time. Children who hear fewer words during early childhood start school developmentally behind their peers and may never catch up. When families read aloud to their young children, they can give them a better start to life. With unparalleled access to families with young children, Reach Out and Read medical providers give books to children at more than 10 well-child visits from infancy until they start school. More importantly, they encourage families to read aloud and engage with their infants, toddlers and preschoolers every day. The effectiveness of the Reach Out and Read model is recognized by the American Academy of Pediatrics in a policy statement that recommends early literacy promotion as an essential component of pediatric care. Our program is both cost-effective, and evidence-based: research shows that our program results in more frequent reading at home, accelerated vocabulary and critical brain stimulation. We value the commitment of our many donors, who have partnered with us to expand our reach. We are now a national organization, currently serving 4.7 million children and their families in the U.S., half of whom are from low-income families. By giving young children a foundation for success, Reach Out and Read is combatting the effects of income inequality. Make Way for Books is an early literacy nonprofit that provides proven programs, services, and resources to 30,000 young children, parents, and educators throughout southern Arizona each year. Our mission is to give all children the chance to read and succeed. We provide proven programs to ensure our youngest children discover the joy of books, develop critical emergent literacy and language skills, and start school ready. We reach young children in the critical birth to 5 years to build a foundation for all future learning. Our theory of change is that we get to every caregiver in a child’s life and ensure that, that adult understands their incredible power to impact their child’s literacy, love of learning, and success. First Things First is one of the critical partners in creating a family-centered, comprehensive, collaborative and high-quality early childhood system that supports the development, health and early education of all Arizona’s children birth through age 5. 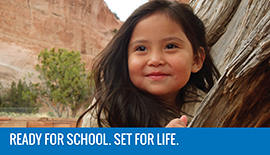 All Arizona’s children are ready to succeed in school and in life. 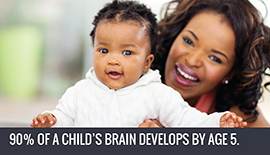 The early childhood years are when the brain grows and develops the most. In fact, 90% of a child’s brain develops by age 5, before they start kindergarten. And scientific research has shown that a child’s experiences in their early years affect how their brain develops. Research has also proven that kids with quality early childhood experiences do better in school. They are more likely to go to college and have successful careers. They also tend to be healthier and demand less from the public welfare system. That’s why First Things First partners with families and communities to help kids have the positive, nurturing experiences they need to arrive at school ready to succeed. We do this through quality early care and education programs, preventive health efforts, and supporting parents in their role as their child’s first teachers. First Book transforms the lives of children in need. Through a sustainable, market-driven model, First Book is creating equal access to quality education — making everything from brand new, high quality books and educational resources, to sports equipment, winter coats, snacks, and more – affordable to its member network of more than 400,000 educators who exclusively serve kids in need. Since 1992, First Book has distributed more than 175 million books and educational resources to programs and schools serving children from low income families in more than 30 countries. First Book currently reaches an average of 3 million children every year and supports more than one in four of the estimated 1.3 million classrooms and programs serving children in need. With an additional 1,000 educators joining each week, First Book is the largest and fastest-growing network of educators in the United States exclusively serving kids in need. First Book members work in classrooms, after school and summer or early childhood programs, shelters and health clinics, libraries, community programs, military support programs, and other settings serving a majority of children in need. Expect More Arizona champions a world-class education – from the early years through career – for every child. Together with a growing network of partners and individuals across the state, we are working to build an education-first culture and create opportunities for you to support students and educators – in your home, your local community and statewide. The Campaign for Grade-Level Reading is accordingly focused on helping communities and policymakers promote school readiness and quality teaching, tackle chronic absence, and improve summer learning, as well as engage parents as their children’s first teachers. Learning begins at birth and healthy development greatly impacts children’s ability to learn: children who are on track in their physical, social and emotional, cognitive, and verbal development are more successful learners from their earliest years, and they are more likely to become proficient readers by the end of third grade. Parents are the first teachers and most important advocates for their children. Research shows that students are most successful academically and socially when their parents are involved and engaged in their learning. Encouraging parental engagement can help turn around the nation’s achievement problems, starting with making significant progress against the milestone of grade-level reading by the end of third grade. The Campaign works with child and family advocates across the country to help assure a seamless system of care, services, and supports from birth through third grade. This includes policy and practice that promotes children’s optimal social, emotional, and cognitive development; improves professional development for the early childhood education workforce, and supports parents as their children’s first teacher and best advocate. We work with state advocacy networks – including KIDS COUNT and Voices for Children – as well as State Early Childhood Advisory Councils to better coordinate and align public, private, and philanthropic investments in early learning. Arizona Ready is a noble society who believes education is the key to life. They give you tips on education. They advise on how to improve and just how to go about that extra mile that can earn you an extra mark. They also offer information on current education programs and general education current affairs. Arizona Promising Practices provides research to practice guidelines, strategies and resources to support professionals and parents in improving results for students with disabilities. The mission of the Arizona Literacy and Learning Center is to help children and youth who have literacy/dyslexia and other language-based disorders, reach their potential to succeed in school, work, and life. ALLC provides comprehensive developmental screenings to preschoolers ages 3-5 to determine if they are developing within the typical range for their age and to see if they are on track for being prepared to enter kindergarten. The Arizona Department of Education is an Arizona state agency overseeing public education. The American Academy of Pediatrics is an organization of 67,000 pediatricians committed to the optimal physical, mental, and social health and well-being for all infants, children, adolescents, and young adults.